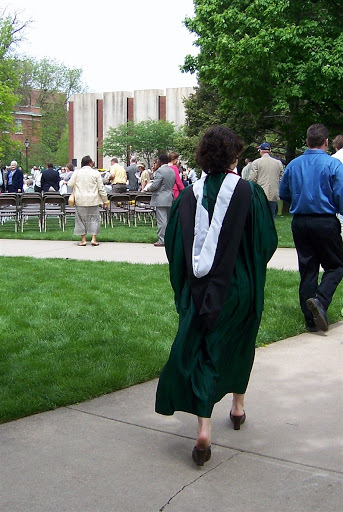 The graduation was a whole week ago, and I got home on Tuesday. Time flies. I had fun, clapped and cheered, went shopping, laughed with my family, and got a little sunburned. Maybe I can make up for my bloglessness with some pictures. This is Rachel, on her way. This is what I have been working on this weekend. The yarn is Blue Moon Bambu, which I got last year on another trip to Chicago. 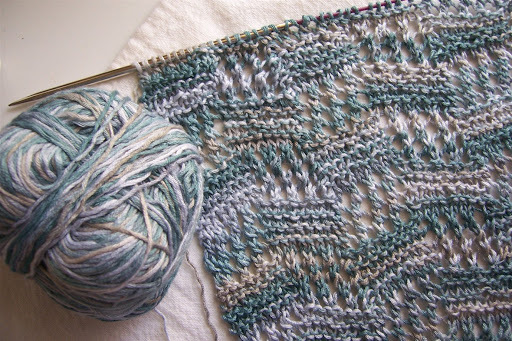 I’d begun a Flower Basket shawl, but it just sat there while I lost interest in the triangle. So now I’m making a scarf for Dancer Niece, who also has some of this yarn. She’s a busy student, and is about as likely to get around to making something as I am to go reverse bungee jumping. Recognize the pattern? I’ll seize any opportunity to knit Tilted Block. I want Becca to have something I made, and she will wear this soft, drapey piece well. Next I give you the delightful prizes I received from Amy Artisan. I was her 800th commenter, you see. Thank you Amy! The yarn is Nashua Handknits Ecologie Cotton in the palest blue color, but which is called “Indigo” anyway. The latest installment of Sundara’s Petals Collection has left me speechless. It’s called “Dahlia.” That’s all I can say without getting a little choked up. My sister, the quilter and blog addict. All I did was point her to Yarnstorm, I swear. Hives. If I knew they were coming, I’d have locked the door. P. S. Thank you all for the birthday wishes! I loved them! I can’t wait to see what you’ll make with that stunning Mountain Colors ribbon (or if you just want to gaze at it for awhile, I’ll be patient!). 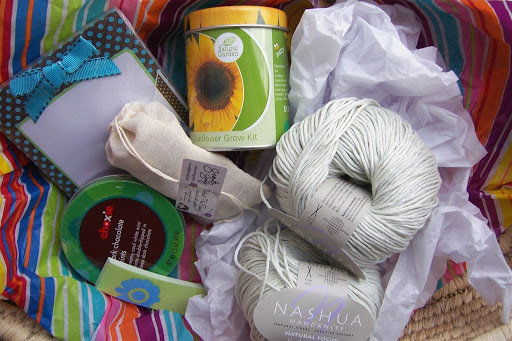 So many lovely goodies – I am especially stunned by Sundara’s new color, Dahlia. wow. Can’t wait to see it knit up.Hives? ugh. hope they go away quickly. Lovely scarf and looking forward to seeing what the Mountain Colors ribbon will be used for. 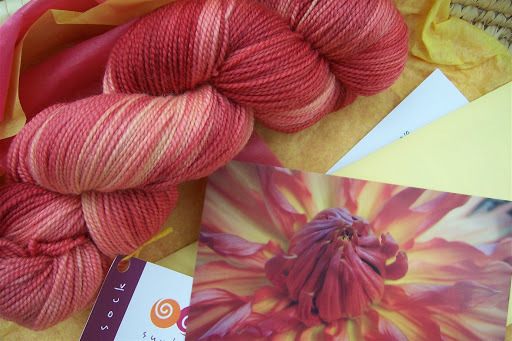 I haven’t been able to put my Dahlia yarn away–it’s so gorgeous! Yikes, hives! Makes me itch just thinking about it. The Blue Moom Bambu and the tilted block pattern are perfect together. I like the looks of the Mountain Colors ribbon too. I’m looking forward to seeing how it knits up. Welcome back!! Tilting block is always gorgeous – I can understand your love for it! Hee hee – I can certainly understand how your sister could get hooked on blogs from Yarnstorm. Has she wandered over to Bemused yet? Jan does some great quilting. I love your still lifes of yarn, knitting and such. You have such an eye for color and shape, jane.Now please don’t tease us with lists of what you could write about. Curious minds want to know! Such pretty things! I’m intrigued by the yarn you are using for your scarf. Off to Google! The Dalia is delicious and looks just like a dalia seen at the Farmer’s Market last fall in Santa Cruz. Amazing dye work! wowHappy knitting and I’m glad you had such a Happy Birthday, too. Thanks for sharing the experience. Oh yes, those are laugh lines. Oooh, I love that scarf you’re working on! Where did you get the pattern? Or is it from a stitch dictionary?I agree about the Dahlia yarn … it is soooo pretty. I almost don’t want to use mine for socks. Wow! Your work is lovely! This is why I love knitting blogs. When I saw the stitch pattern (Tilted Block) in Barbara Walker’s book, it didn’t look exciting. Looking at your shawl has totally changed my mind! Thanks.